As a woman, wearing the right make-up in the right moments is crucial. Some women would even say that your life depends on how well your make-up looks and that is not very far away from the truth. Wearing fresh, high-quality, natural make-up that highlights your best features is what can give you the confidence you need in a cloudy day. Having some of your make-up products and accessories with you all the time can be a life-saver. More than that, try leaving your make-up bag at home during your travels and you are a dead person. Most women carry with them the most basic beauty products that make their skin feel healthy and hydrated, their lips glossy and their eyes tireless and you should, too. If you know how important it is to have these things in your purse or luggage, then you should start looking for the best travel make-up bag. If you are an organized person that needs to put on make-up with a different type of brush on each area of your face, then you certainly need a make-up bag that helps you keep your accessories separated and clean. There are a lot of factors that determine how practical and functional a make-up bag is, although you might say that it is just a simple bag. To help you decide which of the make-up bags that the market has to offer is best for you, we have reviewed 5 of the best-selling products. While reviewing them we have taken into consideration all of the above factors, as well as the price and guarantee. Take a look and see what your options are. If you are a person who is always on the move and you want a make-up bag that is highly portable, this is the ideal product for you. It is easy to carry and its size of 1" x 7.5" x 5" is suitable for any luggage and you can even carry it in your day purse. It comes with two handles, it has two side zipper pockets and three roomy inner pockets that are transparent and give you the visibility you need. This lightweight make-up bag is made of 600D polyester and elastic PVC and it has a nice, zipper closure that helps you secure all of your beauty products. What’s great about it is that it is covered by a 100% guarantee, which means that you will get your money back if you don’t like it. What’s to like about the Premium Travel Cosmetic Bag By B&C - Hanging Toiletry Organizer With Many Pockets? This is the perfect make-up bag for you if you are looking for a casual, yet a feminine design that is also functional. Except for the fact that this bag has a great price, most women prefer it for its multifunctionality and versatility. It can be used both at home and while traveling. It is roomy and can help you organize and group all your personal care products and brushes. Although this make-up bag looks really nice and is quite practical, it is made of inexpensive materials that raise some question marks regarding its durability. Did it ever happen to you to have a make-up bag that looks perfectly, but is difficult to use because of its shape? Sometimes, finding a tiny lipstick or a concealer takes forever if you have a lot of products mixed up together and you might end up taking everything out just to find that one little thing. This cosmetic bag is designed with functionality in mind and is meant to solve the above issue. It is made of 100% nylon, it is water repellent and comes in a round shape that has a 20-inch diameter. When using it, you practically unfold it and lay it out and when you’re done, you simply close it using the “lip” around it, by pulling the drawstring and turning it into a clutch. 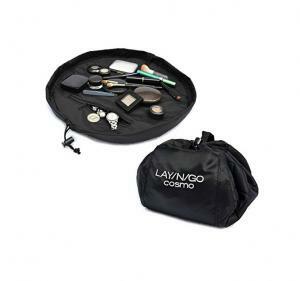 What’s to like about the Lay-n-Go Cosmo Cosmetic Bag? Having to dig in your cosmetic bag is not a pleasant thing to do every time you need something and you are in a hurry. With this make-up bag, everything becomes so much easier, which is the main advantage of this product. Nowadays, we are looking for products that make our lives easier. Also, its size of 6 x 1 x 8 inches is perfect for anyone who travels a lot. The fact that this bag closes using a drawstring is very practical, but at the same time, it brings you a simple design that does not allow you to organize your products in any way. The only thing that you can do is to mix all the products together, as there are no dividers or organizers. This is a make-up bag that was especially designed for those of you who are very organized and can’t stand to lose the tiniest of things. 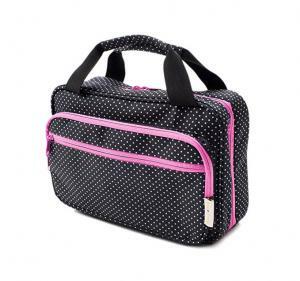 If you are in the search for a cosmetic bag that has a lot of pockets and dividers, this is the ideal product for your needs. It comes at an affordable price, a practical design and it is comfortable to carry thanks to its compact shape and handle. Its design not only helps you find your products in the fastest way possible, but it is also advantageous because it can be used by the entire family. It isn’t feminine or masculine, so both men and women can make use of it. The Rownyeon travel bag is made of waterproof materials that are anti-wear. It has a hard plastic cover and Oxford fabric on the outside. It has a zipper closure that makes it easy to open and a hard strap that makes it easy to carry around. 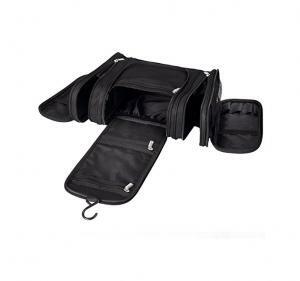 What’s to like about the ROWNYEON Portable Velcro Travel makeup bag / Makeup Case? This make-up bag comes in black, is compact and includes a sponge and Velcro. The best thing about it is that it doesn’t only come in one size. You get to choose the size that you need and the manufacturer designs it for you in a personalized way. Also, you get to choose the size and numbers of the dividers and organizers inside, which is amazing. Although this bag is almost perfect and you can design it yourself, it would be nice if it would come in different colors, other than black. The ideal make-up bag that will fit in everything that you need in terms of cosmetics is here. This is a large make-up bag that you can use as a toiletry bag during your travels, which comes with a total of 5 pockets and 12 organizers. When at home, you can hang it on a wall using the hook that comes with it. It is made of waterproof materials, it is easy to carry and can be used by the entire family. Thanks to its variety of compartments, you can take with you all of your favorite personal care products, including shampoos and creams and forget about leaks and mess. It measures 11.6 x 4.3 x 8.6 inches, it is lightweight and it is made of waterproof 300D Polyester with PVC backing. Why should you buy this travel make-up bag? What’s to like about the waterproof 300D Polyester with PVC backing? The greatest advantage of this product is that it can be used by both men and women thanks to its functional, neutral design. It is large enough to fit in all the products you need and small enough to fit in your luggage. The fact that it is made of high-quality materials influences a lot of buyers’ decision. Be careful about the hook and the zippers. Due to the large size of the travel bag, most people tend to put way too many things in it, until it becomes too heavy. If that happens, there is a good chance that the hook and zippers will break. This is one of the most inexpensive make-up bags that you can find on the market. It comes with a girlie design, in a wide variety of colors to choose from: light and dark grey, ciel, dark blue, pink, orange, black, etc. It is made of water-resistant materials, as well as anti-bacterial lining, so if you have sensitive skin, you can forget about irritations. This make-up bag comes with several inner compartments and includes a durable hook that lets you hang it when you don’t have to take it with you. Its design is convenient and makes it easy to use. It closes up using a smooth zipper. At its 7.2 ounces, it is lightweight and its size of 9.5 x 8 x 1 inches is ideal for travelers. What’s to like about the Itraveller Portable Hanging Toiletry Bag/ Portable Travel Organizer Cosmetic Bag for Women Makeup or Men Shaving Kit with Hanging Hook for vacation? This cosmetic bag brings together plenty of advantages: great design, functionality and organization, all at a very small price. Thanks to its thick bottom, the bag can stand up on its own and does not have to hang all the time. Also, it is made of durable materials that helps you avoid any other such investments. The only thing that might disappoint you when it comes to this hanging toiletry bag is the quality of its Velcro strap that does not seem to be very durable. Why use a travel make-up bag instead of a toiletry bag? By comparison with large boxes that make-up artists use to carry their artillery of products with them, cosmetic bags are much smaller, practical and easy to transport. If you can’t live without your favorite cosmetic products and you find them to be essential especially when traveling, then a travel make-up bag is exactly what you need. Unlike toiletry bags that are smaller in size, this category of make-up storage is larger, roomier and more practical, especially if you are traveling for at least a few days. These bags can be placed inside a luggage or can be carried as hey are using the integrated handle. Toiletry bags are great for daily use, especially if you commute a lot. You can keep the most essential products with you at all times. However, travel make-up bags have a slightly different design that allows you to organize products such as make-up removal pads, brushes, bottles, accessories and many more items that you might need when traveling. They are useful not only when traveling, but also if you have limited space in your bathroom and you want to use them for storage on a daily basis. When is a travel make-up bag really useful? A travel make-up bag is useful for a number of reasons. First of all, they help organize all products. Second, it protects them from shocks and third, it allows you to eliminate the stress of having make-up all over your clothes and shoes in a luggage, in case of an incident. As previously mentioned, travel bags are a little different than toiletry bags. The number of dividers and compartments are of real help. For example, some of them have a special pocket for brushes of all sizes. Others come with a compartment that is designed to hold bottles still while traveling. The fact that they are waterproof and wear-resistant gives them a huge advantage, as you can carry them safely regardless of the weather conditions. Unlike those made of regular fabric, they are meant to protect both liquids and powder products from water. Travel make-up bags are really useful when going on vacation, when traveling for business purposes, as well as when going at a sleepover. We would dare to say that it is safe to keep your travel make-up bag with you at all times in your car if you commute a lot, so that you will always be relaxed and know that you have everything you need at hand. This is the most interesting aspect of a travel make-up bag. Some of the best products are extremely practical, easy to use, easy to clean and can be used for years on end. The fact that they have a large number of compartments and dividers and that they are quite roomy, help with all face and product care products storage. Most women use it at home, too, by hanging the bag somewhere close to a mirror. Besides being practical, it also helps women be much more organized. Having a highly functional make-up bag that can be used as a travel bag, too, is very important, as it adds up to your own comfort during your travels. All of the make-up bags above come with features that you might find useful. However, there are a lot of other similar models that attract highly organized women just like you, who don’t like to have their make-up products everywhere in their purses or luggage. Keep an impeccable make-up all the time, regardless of the event by organizing your products and accessories in a suitable cosmetics bag that you can take with you all the time. Having to worry about missing essential products is way more stressful than having to take such a bag with you. Analyze the 5 best-selling products on the market that we have reviewed above and make your own choice by thinking about their pros and cons.